History, n. an account mostly false, of events mostly unimportant, which are brought about by rulers mostly knaves, and soldiers mostly fools. Marriage, n. The state or condition of a community consisting of a master, a mistress, and two slaves, making in all two. Self-Esteem, n. An erroneous appraisement. 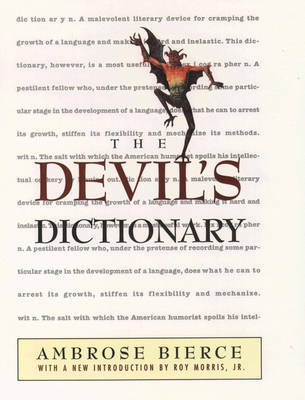 These caustic aphorisms, collected in The Devil's Dictionary, helped earn Ambrose Bierce the epithets Bitter Bierce, the Devil's Lexicographer, and the Wickedest Man in San Francisco. First published as The Cynic's Word Book (1906) and later reissued under its preferred name in 1911, Bierce's notorious collection of barbed definitions forcibly contradicts Samuel Johnson's earlier definition of a lexicographer as a harmless drudge. There was nothing harmless about Ambrose Bierce, and the words he shaped into verbal pitchforks a century ago-with or without the devil's help-can still draw blood today.